NEW YORK—New York art lovers in search of treasure are well advised to venture across the Hudson River and to go straight to the gallery of The Florence Academy of Art US inside the Mana Contemporary (that mega art complex and former tobacco warehouse in Jersey City) to see the exquisite “Selected Works” by Stephen Bauman and Cornelia Hernes. It’s the couple’s first exhibition of just the two of them, and marks their recent arrival from Sweden. “It feels good to have an exhibition upon arriving. It’s sort of a new beginning,” Hernes said at the opening on Oct. 30. Bauman, from Florida, and Hernes, from Norway, met in Florence, Italy, while studying in the founding school of The Florence Academy of Art (FAA)—a leading art education institution in the realist tradition. They taught there and again later at the FAA’s branch in Mölndal, Sweden. In October they became principal instructors at the academy’s U.S. branch, which opened just over a year ago. 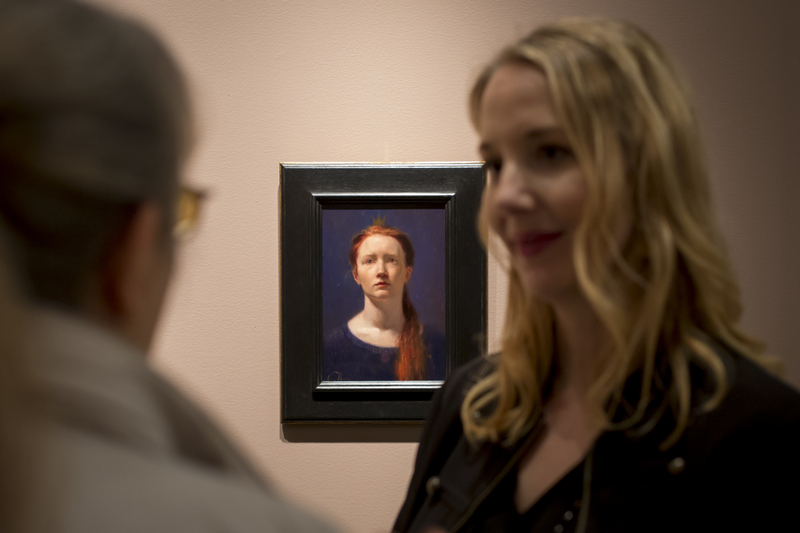 The exhibition includes 27 works—a mini-retrospective of the work they created in Europe—and serves as a springboard into the next chapter in their lives. Rooted in their FAA education, both artists are committed to creating highly-skilled representational art. While Hernes’s work leans more towards narrative representation, Bauman leans more towards abstraction. Bauman’s and Hernes’s works are equally stimulating to the imagination, yet they arrive at that same goal from different points of departure in the creative process—in terms of the types of clues they give and how realistically they are rendered. Seeing their works side-by-side makes for a delightful internal journey. Hernes draws inspiration from archetypal and mythic symbolism, triggering a mysterious mood, whereas Bauman focuses more on technical experimentation, on how much visual information to leave out, and in what way, so that the viewer can fill in the rest with their own perception. Bauman worked on his charcoal and graphite drawing, “End of the Night” for about five months in between other works in progress. It’s probably his first drawing in which he decided to idealize the figure. Some parts of the drawing are rather sculptural-looking and finished, while other parts only suggest the form. It shows a half-length male figure. He has heavy eyelids, an elongated neck, and arms up, forming right angles. “A lot of babies sleep that way,” Bauman said. A second head that he drew from the same model, floats in the background. It seems to allude to the man’s subconscious. “There is something very interesting between being awake and being asleep,” Bauman said. “I had this idea of this person floating, drifting up into the frame. If you can imagine this picture as a cropped version of a reality that exists with endless permutations behind it, this picture would be a frozen moment of that drift.” That’s as much as he would explain the meaning of “End of the Night.” He said, it’s fair to say, he was at the point where words end and the picture speaks for itself. Other Bauman pieces in the exhibition include three gouache paintings on paper, which immediately evoke a swell of tenderness (“White Flowers,” “Egg with Vessels,” and “Nelle”), and a series of unfinished-looking larger works painted with the same limited palate, where he’s experimenting with creating rather depersonalized portraits (“Nils-Gustav,” “Giacomo,” and “Mia”). “Mythological stories are interesting to me because they contain something archetypical, universal, psychological, and something relatable,” Hernes said. Her largest and most thought-provoking painting in the exhibition, “The Tapestry of Life,” depicts the three fates. She spent about six months planning and three months painting it. “Essentially you have these goddesses of destiny who weave together the threads of humanity. They are present when somebody is born and at a life’s end. When they cut the thread, it symbolizes the conclusion of that life,” Hernes explained. The three fates are weaving a tapestry with spirals that form an infinity symbol. The tapestry has an unusual warm golden color that is a bit hypnotizing. “I imagine that together they are making up a story of somebody’s life, as they are weaving their threads together with the other threads,” Hernes said. They sit by a Nordic mythological tree of life, called Yggdrasil in Norwegian. “It sort of extends to all the different dimensions, of all the different parallel worlds. Overall, all the symbolism in the painting creates an interesting metaphor of life. “You can see that you are part of something larger essentially and that life is not necessarily a linear, tidy experience,” Hernes said. Other Hernes pieces in the exhibition include still life paintings, one of roses that almost seem to come straight out of the frame; figure paintings from her maiden series, such as Ophelia; portraits of Pierrot; beautifully rendered drawings of women wearing masks; and a “Blue Princess” who is a little moody, a bit introverted, but still grounded. She wears an austere crown that reveals itself more when looking at the painting from a distance. 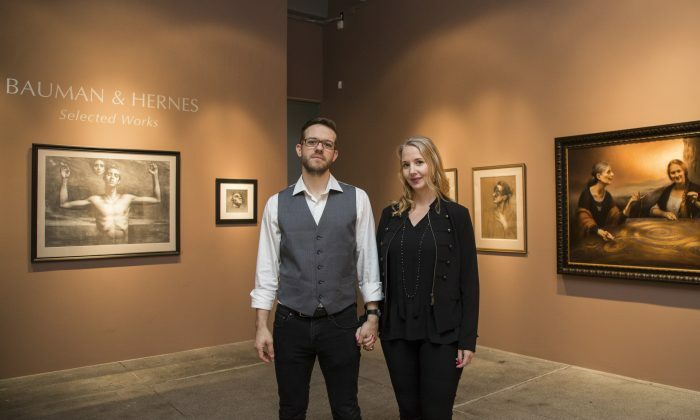 Bauman & Hernes “Selected Works” will be open to the public until Dec. 16. The Florence Academy of Art US is located at Mana Contemporary, 888 Newark Ave, Jersey City (Path train station to: Journal Square).